Julie Stulz and Martin Weckerlein met in 1999 and married in 2002. I have a lot to thank you for, Julie and Martin Weckerlein. Thank you for, years ago, helping an old journalist from falling into a spiral of cynicism about the human race. 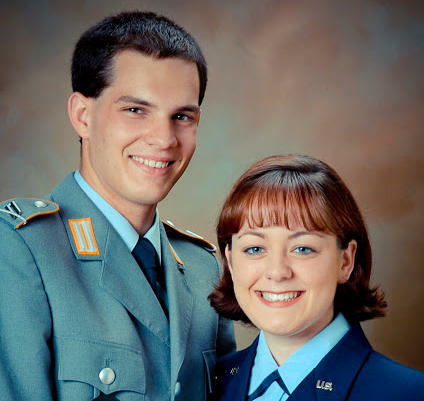 Thank you for being an extraordinary couple from the start, a young woman from Fort Thomas who joined the Air Force and a young man from Germany who wore the uniform of his nation's military and, improbably, met, courted, fell in love and got married. Thank you for being just as much as in love today as that day 16 years ago when you stood at the altar of a 700-year-old church in Nuremberg, surrounded by friends and families from two continents, and exchanged your vows. Thank you for bringing into the world four bright and beautiful children who have truly become citizens of the world; who have been taught not to live in fear; to be curious about the world around them; and to spread love and joy to all they meet. Thank you, too, for raising this family, this multinational force of love – first here in the U.S. and, for the past several years, in Germany, where Julie works as a communications strategist for the U.S.-European Command headquarters, which includes working with NATO. From top: Claire, Julie, Martin, Jasper, Paul and Laura. And thank you for stepping into the life of this crusty old reporter in the days following 9/11 and the beginning of the war on terrorism, when, frankly, it was depressing on most days to be a newspaper reporter. In a time of war and uncertainty and fear, you gave me a chance to tell a true love story to the readers of the Cincinnati Enquirer – a love story that just continues to grow as the years roll by. Crusty old Wilkinson. Telling a love story. Only Martin and Julie could have pulled that off. I first spoke to Airman Julie Stulz by phone not long after 9/11. For about a year, she had been a military journalist, working in the public affairs office of Ramstein Air Base near Kaiserslautern. After 9/11, Ramstein was on a high state of alert. It was the place where humanitarian flights dropping food over Afghanistan originated, and it was the place where injured American soldiers first came to be treated, and where the bodies of those Americans in uniform were returned. I remember calling Ramstein's public affairs office one day from my desk in Cincinnati and, just by chance, hearing on the other end of the line, Airman Stulz, how can I help you? What I needed was help in locating any Air Force pilots from the Cincinnati or Northern Kentucky area who had been involved in the flights over Afghanistan. Julie was glad to talk to somebody from back home and got on it right away. Soon, I had a pilot I could speak to about his experience in war. I talked to her many times subsequently and we became friends. I'd tell her about the news on the home front and she'd talk and talk about this handsome German soldier who was her husband-to-be. I enjoyed listening to the enthusiasm and excitement in her voice as she described how she and Martin had come together; how anxious they both were for the upcoming wedding. "To say we are happy is to say the ocean is deep,'' said Airman 1st Class Stulz. Their love began long before either of them had put on a military uniform. Three years before, Julie was a student at Highlands High School who became a foreign exchange student in Germany. Martin was a former student at a boarding school in Germany who came back to help put on a school play. The two met at a party at the school. They sat up and talked until 6 or 7 a.m., "realizing we liked each other a lot," Julie said. They became the best of friends. After Julie went home to Fort Thomas, Martin came to visit. They spent time seeing the sights of Cincinnati – Kings Island, Krohn Conservatory, Union Terminal. Little did they know then that 16 years later, Martin would return to Union Terminal, where he climbed up onto the catwalk behind the clock and, surrounded by family and friends, took the oath to become an American citizen. Martin Weckerlein in his citizenship ceremony at Union Terminal in 2015. "Union Terminal was really nice, too, and fitting because I consider Cincinnati my adopted hometown,'' Martin wrote to me recently on Facebook. "I'm glad we have the chance to live here in Germany right now, so that the kids can learn the language and be near my family too." After Martin's 1999 visit to Cincinnati, this relationship was clearly becoming serious. The next year, Julie spent Christmas in Erlangen, Germany, with Martin and his family. "I remember telling Martin I was going to join the Air Force and I hoped I'd be stationed in Germany,'' Julie said. Claire, the oldest child, came along in 2003. 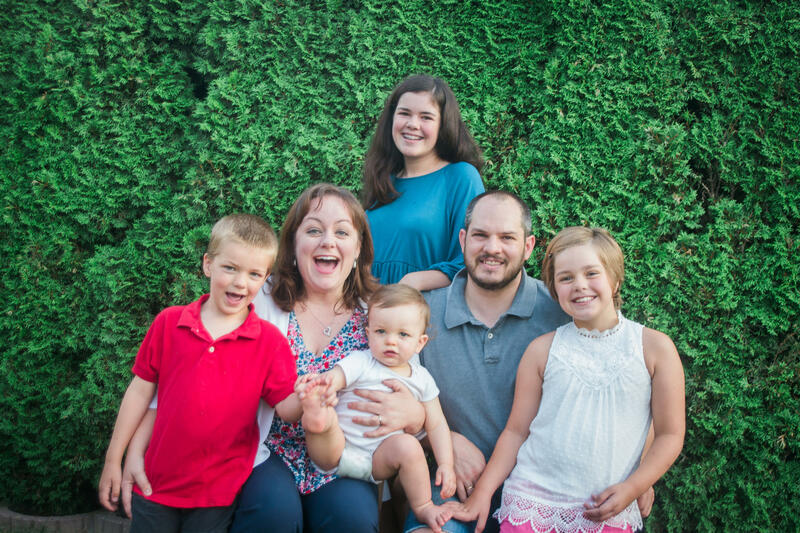 Eventually, the young family moved back to the U.S., settling in the Washington, D.C. area, where after serving nine years in the Air Force and four years in the reserves, Julie became a civilian, employed by a federal government agency. Martin enlisted in the U.S. Air Force Reserves in early 2013 and served at Andrews Air Force Base. Two more kids had come along – Laura, now 9, and Jasper, who turns 7 this month. And it was not long after Martin joined the Air Force Reserves that Julie was offered the Department of Defense job in Germany. It was a huge undertaking, uprooting a family of five and moving across the Atlantic. But, in those days before they left, I also remember a sense of excitement and wonder at what their lives would be like in a new country. They relocated only a few hours away from Martin's family and the children have gotten to know a side of the family they had never met. And Julie's cousin and her husband, who also works for the Air Force, are stationed nearby. And the Weckerlein kids have already seen more of Europe than most Americans will see in a lifetime, because the family seems always to be traveling on weekend trips to Italy or Austria, Belgium or the Alps. A little over a year ago, the newest Wecklerlein was born, Paul. He is already walking (rather confidently for a one-year-old, from what I have seen in a video). His sisters adore him, and his brother Jasper is probably grateful for another boy in the house -- he's no longer out-numbered. All four Weckerlein children are bright, creative, sweet and full of fun. Each has a distinct personality that makes it something of a sport for their family friends to try to guess what they will do when they grow up. My guess is whatever they do, they are going to make their parents proud. "The three older kids attend German schools and are doing well,'' Julie wrote to me on Facebook. "They grew up with their Dad speaking German to them, but it's different being fully immersed in a learning environment, and there've been moments when it felt overwhelming for all of us." But the kids, Julie said, "constantly impress us with their ability to push through any language barriers, making friends and earning good grades." They are dual citizens but are affectionately known in their classrooms as "the American." "We understand that we're de facto American ambassadors over here and we want to represent well,'' Julie said. Claire, the oldest, "is often called upon in class to answer questions and talk about American politics and culture, whatever is in the headlines that day," Julie told me. And, for that, we can all be thankful to Martin and Julie.